The gooiest zucchini brownies ever! You’d never guess these are made a little healthier and made with whole grains (but can also be made with all-purpose or gluten-free flour) or that zucchini and that applesauce takes the place of oil! Scroll to the bottom of the post for a how-to recipe video. I don’t like zucchini at all. I’m also not a fan of “hiding” veggies in my dessert recipes, because I can always tell that they’re in there. That’s not the case with these brownies! These healthy zucchini brownies still have sugar in them, but they’re not quite as bad as your usual brownie recipe. If you want something especially naughty, try these gluten-free brownies, which are really the best brownies ever – gluten-free or not! They can also be made with whole wheat flour. These chocolate zucchini brownies have no added fat* (except what’s in the chocolate chips) and are full of zucchini and whole grains (but really do not taste like it!) so you can feel good about giving these to your children. * I love healthy fats and usually load up my recipes with them. But in this one, it’s just not needed! Really, unless your kids watch you make these, or you grate the zucchini coarsely, there’s no way that they’ll be able to tell that these brownies have zucchini in them. Or that they’re whole wheat or whole spelt. The gluten-free version also doesn’t taste gluten-free! Want some more kid-friendly recipes? Try my no-bake oatmeal cookies. They’re whole grain and naturally gluten-free + vegan. And perfect for the lunch box! This whole wheat banana bread is also a favorite and you can always toss in some walnuts or chocolate chips for something different. And if you have portion control issues, these brownies halve beautifully! Use a 9″ x 5″ loaf pan and bake for only 14 minutes. I highly recommend not decreasing the amount of chocolate chips in the batter. You can definitely skip the ones on top but these zucchini brownies rely on the sweetness and flavor from the chocolate chips! I’m pretty sure you’d be disappointed if you didn’t use the chocolate in the batter. And I definitely don’t want that! Be sure to use Dutch-process cocoa powder in these zucchini brownies. If you use the regular natural kind (like Hershey’s) these zucchini brownies will likely come out cakey instead of nice and fudgy like you see! Besides, once you have some Dutch-process cocoa powder, you’ll be able to make these whole wheat chocolate cupcakes! They’re seriously just as delicious as traditional cupcakes made with all-purpose flour. If you don’t mind the brownies being cakey and want to use regular cocoa powder, then go for it! Some commenters have mentioned making them with regular cocoa powder and loving them. Sprinkle 1/2 cup mini chocolate chips on top. Store in an airtight container for up to 2 days at room temperature or up to one week in the refrigerator. I recommend storing them in the refrigerator right from the beginning due to their high moisture content. 495 comments on “Zucchini Brownies (gluten-free, whole grain, dairy-free options)” — Add one! Hi Erin! I plan on making these for our Father’s day dessert. We’ve been trying to make some healthy changes to our diets by eating more whole, unprocessed foods. I was super excited to find your recipe. I love to cook, but I am NOT a baker, so I plan to collow your recipe to a T. With that said – as far as sugar is concerned is cane sugar a good option to put in this recipe? Thanks in advance! 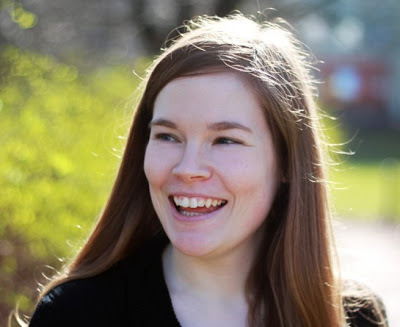 Hi Karin! Sorry I just now saw your comment. Cane sugar should be fine as long as it’s not SUPER coarse. Just make sure to let the mixture sit for a bit to let is dissolve like I mention in Step 2. I hope everyone will enjoy the brownies and sorry again for the slow reply! Aww, yay! So happy that your dad didn’t end up disappointed after all. And tsk tsk to your husband… sharing the secret. ;) Thanks for your comment! Woohoo! So happy to hear that. :) Thanks a bunch for your comment! Hi! 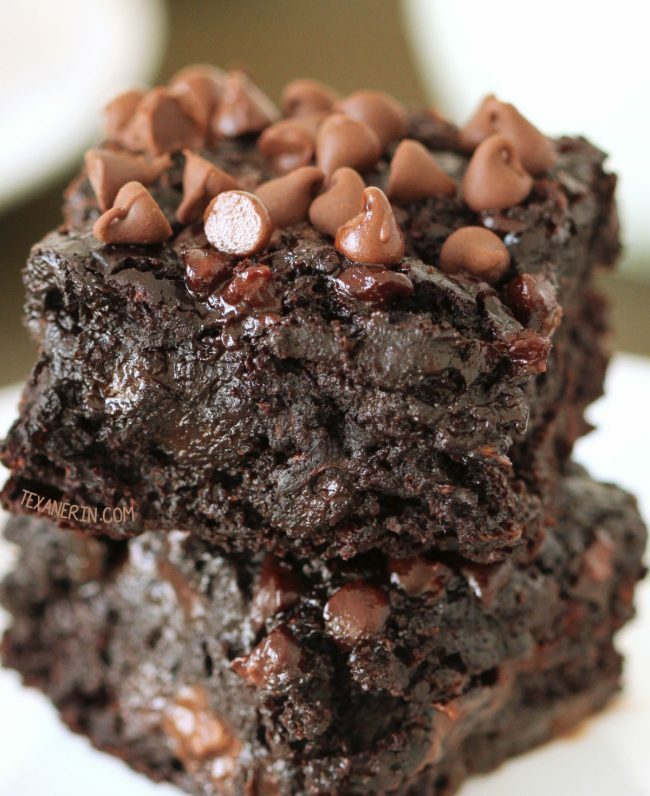 I’ve been looking for the perfect zucchini brownie recipe and these look great! I’ve tried one before and it was good but the zucchini was not grated enough for my liking. My kids loved them but I was wondering if taking the required amount of zucchini and putting it in the food processor would make too much of a mushy difference for these? does the zucchini need to be peeled first? can the appplesauce be substituted with nut butter? what are the nutritional facts for this recipe? Yes, the recipe calls for peeled zucchini. :) I’ve never subbed applesauce with nut butter so I can’t recommend it. I don’t have that info but you can copy and paste the recipe here for the nutritional profile, if you’d like. 1) I can’t find Dutch-processed cocoa powder. What adjustments do I need to make if using Hershey Cocoa Powder? 2) I only have Mini chocolate chips…How much should I add to sub the 1cup reg morsels? Hello! Unfortunately I don’t know what adjustments you’d need to make. It’d require a bit of testing and I haven’t done that. Other people have enjoyed them with Hershey’s cocoa powder, but a few have said they come out cakey. I would use 1 cup mini chocolate chips in place of the regular-sized ones. Hope you’ll like them! I’ve made these a bunch of times and they are delicious. Do you think this recipe would work as cupcakes? I’m happy you enjoy them! You could make individual-sized brownies using a muffin pan (maybe filling them 1/4 or 1/5 full) but filling the batter almost to the top and having them come out in cupcake shape… I’m not so hopeful that that’d work well. Do you squeeze out the excess water from the grated zuchinni or do you add it as is? I added it as is. But if yours is dripping wet, you might want to get rid of some of the excess water. Great recipe! Got a batch in the oven right now. Only difference I used is honey as my sweetner! and peanut flour instead of the whole wheat! Oh, wow! The peanut flour’s an interesting sub. How much honey did you use? Thanks for your comment! Thanks! I’m not sure what would work well here but there are several suggestions found on this page. My vote would be for banana puree, but you’ll likely be able to taste it. You could try puréed pear or pear baby food if you want to be lazy! These are soooo good! I made these a few months ago and had to try it again! I have a batch in the oven right now… I’m so excited! :D Thank you for the wonderful recipe that I can feel good about. Aww, yay! I’m happy that you’re making them again and that you like them so much. :) I hope this batch comes out just as well. Thanks a bunch for your comment! How do I cook with the zucchini? Do I peel the skin off and put it in a blender or just shred it with a cheese grater? I’ve never made brownies with zucchini before. What’s the nutritional info for these, please? Hi there, hope I’m not repeating a question but I am about to make these with my nephews and wanted to substitute the coconut sugar because of an allergy but I also don’t use regular sugar. Do you think I could use a banana or extra applesauce? Thanks! Hi there! I haven’t had a good experience when it comes to subbing bananas or applesauce for sugar. If you feel like experimenting, this page may have some helpful tips for you. I’d love to hear how they come out if you try them! These were honestly super good!! I made them with egg whites instead. I included 3 egg whites and put 1/2 cup of whole wheat flour and 1/4 cup of coconut flour and they turned out wonderful! ALSO, I forgot to mention that I baked them as cookies so when the outside looked dried out, I removed them and as they cool, they get moisture and softer. Another interesting change. :D What kind of texture did they have? Were they like cookies or brownies but in cookie shape? Sounds like something I need to try! Coconut flour?! That’s an interesting sub. I’m shocked (but happy!) that that worked. :) Thanks so much for your comment! Made these this afternoon with coconut oil, since I didn’t have applesauce on hand. Thank you for this delicious recipe! Melty, chocolatey, & satisfying. I will be making these again. Could I double this and bake it in a 9×13 pan instead? I haven’t tried it but I’m assuming that’d work! The difficulty would be the baking time. I’d keep a close eye on them and start checking them every 3-5 minutes after the recommended baking time for an 8×8. BEST BROWNIES EVER! That is all :) Seriously, a must bake. Haha. I’m thrilled you liked them so much! :D Thanks for your comment! Hi everyone- i’m pretty new to substituting vegetables in baking, but I’m excited to try this recipe! Does the zucchini have to be cooked first or does it go in raw? Hi there! It goes in raw. :) I hope you’ll enjoy them! Just made these, and wow!!! They’re fantastic! Thank you for such a great recipe! And thank you for your comment! :) I’m happy you enjoyed them. As I type this my three year old is quietly devouring a brownie. These are very good! I made the mistake of leaving them in too long. As I set the timer for ten more minutes I came back to read comments and saw leaving them in longer can make them more cake like. So next time I will stick to 30 minutes instead of 40! They aren’t TOTALLY cakey though. The center looks more gooey. I will absolutely make these again. I used whole grain flour as well and you absolutely can’t tell. And a side note – I LOVE that your comments are mostly from people who actually made the recipe. That is so helpful when someone is considering trying a recipe. And your feedback to commenters is so helpful and respectful. Thank you so much! I look forward to trying more of your recipes! Actually- while putting away my cocoa I realized it was a blend! Not 100% Dutch process. That in combo with baking too long made them slightly cakey. Still delicious though. Looking forward to trying again with the proper cocoa and cooking time! I’m happy to hear that you liked them! It shouldn’t have taken an hour, though. Maybe that’s why they were like thick cake? I made these the other day and when I checked with a toothpick, I couldn’t get it to come out clean. Everywhere I checked, it came out with melted chocolate on it! But not raw batter. It’s tough to tell when these are actually ready! But if you liked them that way, then it’s great. :) Thanks a bunch for your comment! Thank you for sharing this recipe! I’ve tried it and it turned out great. Just wondering — can these brownies be put in a freezer? The tigernut ones with pecans freeze beautifully, so I bet the regular ones would as well. Heating them in the microwave, they even retain the wonderful gooey texture–I didn’t expect that! I take them for a snack at work and they hold me 4+ hours until my next meal! Thanks for the tip! That’s great to know. I’m happy that they reheat well! That’s great to know that it works with stevia! Does it have an aftertaste? Now I can refer to your comment when people ask for a sugar-free version. :) Thanks a bunch for the tip and for your feedback! Mine came out extremely dry despite cooking it for 29 minutes with only the middle part moist. Kind of kicking myself for wasting all those ingredients and not taking the brownies out sooner. But I’m sure this receipe is delicious as the small middle area tastes amazing! How long would you recommend baking these in a dark 8×8 pan? Should I wring out the zucchini to remove excess moisture? If i don’t want to use cocoa powder can i substitute with lets say 1/4 cup of melted dark chocolate? And maybe reduce the sugar? I’m sorry but I really don’t think that that’ll work! You can read more about why here. I recommend just getting some cocoa powder. :) I’d hate for you to waste your ingredients by experimenting with chocolate! Could I use teff flour for these? Yep, and I’ve made that one twice and its delicious! Was just curious since I have the teff flour laying around. I may just use the 1-1 GF baking flour just to be safe. I think that’s a good idea! I’d hate for you to waste your flour on experimenting. I’m planning on trying an oat flour version of this soon so at least there’ll be 1 GF option soon. :) And I’m happy you enjoyed the other brownies! I used a GF flour blend of buckwheat & sorghum flour & it turned out just fine. Also I used chia seeds for the eggs. It was delicious! Thanks for sharing your GF / vegan version! Sounds great. :) So happy they came out well for you! Just made these, they’re AMAZING! So delicious! Hi,do you think I could use liquid sweetener instead of sugar, would it make any difference in the texture? Hi there! If you add liquid to the recipe then you need to reduce the other liquids in the recipe. Unfortunately, this recipe doesn’t have any milk or anything that you can really reduce so I wouldn’t recommend it. Oh okay, and what if I exclude the sugar from the recipe/use a smaller amount ? These are amazing! The recipe turned out perfect! Can you use cacao powder instead of Dutch cocoa? Made these a few weeks ago and like lots of people have said before, it was more like a moist cake…. so, I put a thin layer of cool whip on the top and called it zucchini cake… it was loved by all our kids and family at our cookout! I will replace my regular chocolate cake recipe with this one for now on. It’s our new family favorite! ! Thank you! Did you use Dutch-process cocoa powder or the regular Hershey’s kind? I think the commenter below you has figured out why they’re coming out cakey for some people but not cakey for others! And I’m so happy you still enjoyed it and turned it into a cake. :) Thanks so much for your comment! I’m not sure if the mystery of the “cakey” brownies has been solved but I’m quite sure it has to do with Dutch-processed cocoa vs natural cocoa. Dutch-process cocoa has a nutral pH which means the recipe needs baking powder to have any leavening occur, which is not what you use in your recipe hence yours are dense and moist. If someone substitutes natural cocoa it will react with the baking soda and cause a cake-like texture. The two cocoa’s are not interchangeable. Haha. Better than a bunch of random film trivia, like mine. ;) Thanks again! Mine came out like a cake. Used Dutch cocoa and followed exactly. Only baked 32 minutes. Hmm not sure. Tastes pretty good though. I made these last night. I will make them again but i will tweak the recipe. i used a tablespoon of pure vanilla extract and these had a very strong taste of liquor. So i will cut that back quite a bit. The brownies were more like cake but I may have stirred them too much or baked them too long, according to your comments. But over all I will be making these again. Thank you for sharing this is a keeper. Oh my! These are so decadent! Delicious and easy. I skipped the chips on top. Oops, forgot to add a 5 star rating! If I am in the mood for a healthy desert and don’t have zucchini could I substitute it for a banana? (I’m not familiar with substitutions just trying to eat healthier) LOL any advice would help! Thanks! It is splendid to come across your recipe for healthy brownies. Just a thought to help out those who found their brownies turning out cakey could be the baking time….I experiment a lot with mixed Millet/buckwheat flours in brownies and I think it helps to get the brownies out soon as they are at a stage where a few crumbs stick to the tester/sticky as you mention in the procedure. Timing is key when it comes to making fudgy multi-grain brownies. Do you think these would be 21 day fix approved?! PLEASE SAY YES! I’m sorry but I’m not at all familiar with that program! Do they have guidelines anywhere? Hmm. I can’t find any mentions of sweeteners (maple, agave, or sugar) in that post, though I didn’t read the comments! The problem with using a liquid sweetener is that you’ll be adding quite a bit of liquid, which I think will make the brownies cakey. Holy Toledo! 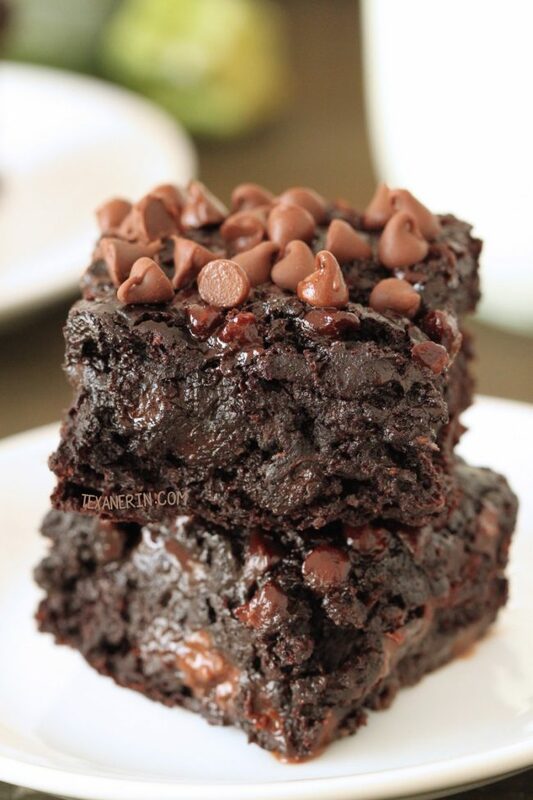 The most moist delicious brownie! I just made these and they are amazing!!! I left out the chocolate chips (I didn’t have any on hand) and it still came out delicious!! I used me own mix of gluten free flours (instead of the whole wheat flour. Yes these brownies are a bit more ‘cake like’ but they are super light and moist. A total winner! Thank you for sharing!! I’m happy your GF mix worked out well here! Which flours did you use? I’m thinking of trying these with buckwheat. I’m pretty sure they’d come out gooey and fudgy like the whole wheat version with that. :) Thanks a bunch for your comment! For a buckwheat flour substitution how would I change the measurements? Or is it a 1:1? I love to bake but up until today everything I’ve baked has been super unhealthy (albeit delicous). I’m looking to make some healthier changes but I could never cut out sweets! I tried this recipe today and I have to say, these are by FAR the best brownies I’ve ever had. These will be my go-to from here on out. Thank you! I followed the recipe, but mine turned out to be more of a cake consistency than brownie… What are your thoughts? Still delicious though! Did you make any subs at all? Or did you perhaps mix a little too much? Or did you maybe use a black or very dark colored pan? They definitely shouldn’t be cake-like but I’m happy they were still tasty! I totally agree, this was very cakey, not what I was expecting. Good, very good, but it was a chocolate cake with chocolate chips. If these brownies came out cakey, I’m pretty sure something must have gone wrong. Or did you make any subs at all? Or make any changes to the recipe? Or perhaps overmix the batter? If you overmix, that can lead to more cakey brownies. I’m happy you still enjoyed them! We went plant based last January and this brownie has become our occasional treat! Instead of eggs I have used flax eggs (1 Tbsp ground flax with 3 Tbsp water per egg) and last time tried an aqua faba substitute (the liquid that drains off of chick peas). Both work fabulously!! These brownies are rich and moist. Our favorite way to eat them is topped with fresh strawberries. I made these tonight and they are delicious! I was making them on a whim from my pantry and only had granulted sugar so I used that. I also only had a bag of mixed chocolate chips and peanut butter chips and let me just tell you… I don’t regret using that combo! In the future I’m going to try to pare down the refined sugar even more and use the coconut sugar and maybe a different kind of chocolate chip, but for now I’m enjoying these and feeling pretty satisfied with myself that they are pretty healthy! Mixed chocolate and peanut butter chips sounds amazing! I’ll definitely have to try that. :) I’m happy that they came out well for you. Thanks a bunch for your feedback and let me know how the different chocolate chip versions go! Hi, do you think we can sub applesauce for the eggs and still get a good result? Thanks! Hi, there! I haven’t tried that sub so I’m not sure if it’d work out. I’m pretty sure it’d make the brownies a bit more cakey and a lot less fudgy, though. Sorry I don’t have a more definite answer for you! How many calories are in each brownie and can you substitute whole wheat flour for almond flour? I don’t have that info but you can copy and paste the recipe here and it’ll give you what you’re looking for. :) Almond flour isn’t interchangeable with wheat. 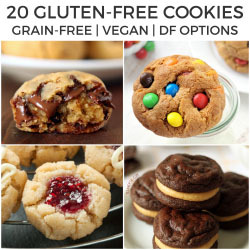 If you need these to be gluten-free, I’d recommend oat flour (though I haven’t tried it myself). No, sorry. Coconut flour also isn’t interchangeable with wheat flour (or any other flour for that matter!). If you want to make these gluten-free, I recommend using a GF baking mix that’s a 1-to-1 sub for all-purpose flour. THESE ARE THE BEST BROWNIES I’VE EVER MADE! I was looking for alternative ways to make desserts and cam across this recipe i tried it and they were perfect, i have made them multiple time since. One time i used half chocolate chips and half butterscoth for a party everyone was in awe….Tonight i made them and substituted the applesauce for pumpkin puree and added nutmeg and cinnamon to turn them into delicious fall brownies….MY FAVORITE RECIPE! thank you so much ive had so many people ask me for the recipe. Wow! I’m so happy that you’ve been enjoying them so much. And I love your experimenting! The pumpkin puree version sounds like something I need to try. :) Thanks a ton for your feedback and for sharing your variations!